EL PASO - January 17, 2019 - El Paso Locomotive FC Signs veteran Irish Midfielder, Richie Ryan, from FC Cincinnati, pending league and federation approval. Ryan has amassed a legendary professional career that spans 15 years and two continents. He made his professional debut with Sunderland in the English Premier League in the 2003 season. 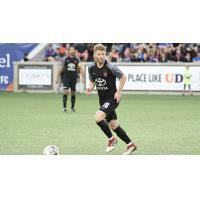 After an 11-year career in Europe, playing in the first division in Ireland, Scotland, and Belgium, Ryan moved to the United States and joined then NASL club Ottawa Fury for the 2014 season where they reached the finals. Ryan most recently played with USL Championship club FC Cincinnati, who will be premiering in Major League Soccer (MLS) this year as the newest expansion club. "Having known Richie personally for a few years, coupled with his undoubted quality and winning pedigree on the field, I am honored to have the opportunity to work closely with him again," said Head Coach Mark Lowry. "The high standards he is going to bring to our group both on and off the field will go a long way to helping us achieve the goals that we have set." "I want to thank the ownership and upper management at El Paso Locomotive FC for helping me bring in an individual of this caliber. Big thanks to Richie and his agent for making the process a smooth one," said Lowry.